Sunny Ofehe is a Dutch-Nigerian activist born 1st February 1972 in Lagos, Nigeria. He attended the University of Benin, Nigeria and fled Nigeria in 1995 to escape the military brutality of the late former Nigeria leader Gen. Sanni Abacha and arrived The Netherlands where he applied for political asylum. In 2005, he founded Hope for Niger Delta Campaign with headquarter in Rotterdam, The Netherlands and currently acts as the Executive Director. 4th October 2007, his mother was brutally assassinated by “hired killers” in what has been considered a political motivated killing. 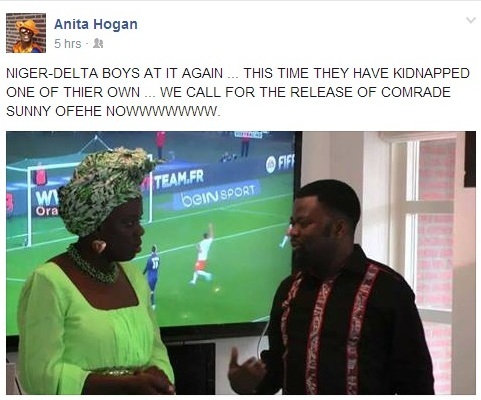 He has now been kidnapped as can be seen by Nollywood Actress Anita Hogan’s facebook post. No further details about his kidnap at the moment but will bring more news once I get any tangible information. I pray he is well and safe. This entry was posted in Breaking News, News, Politics and tagged COMRADE SUNNY OFEHE HAS BEEN KIDNAPPED.